Ya mon! Rise up and blast off with this truly original collection of modern Jamaican musical stylings straight from the ISR camp. Industrial Strength continues to push the limits of genre, this time by lacing the authentic sounds of Dub, Reggae, and Dancehall with futuristic flavor. Future Clash is specially designed for producers looking to delve deeper into material rooted in real foundation. Following in the foot steps of our Dubstep Massive pack Future Clash is bursting with 1.7 Gb of smoking 24 Bit content, and with all the extras we added, this bag of tricks is gonna be your new go to sound source for deep dub goodies. 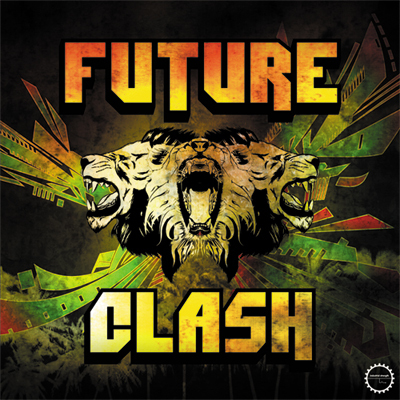 Spanning across six different tempos, and a diverse array of vibes and riddims, Future Clash features expressive samples to build from when creating in the studio. The pack includes heavy bass and sub lines, bright skanks, dark dubby organ loops, futuristic leads and pads, brass accents, tuned percussion, techy and booming drum loops, and a slew of versatile sound effects. Future Clash comes correct with Battery 3, Kontakt, Maschine, and Logic ESX formats to integrate seamlessly into your DAW. All samples are keyed and ready to match; apply them at any tempo to expand the possibilities even further. This fresh pack enables creators of all types of electronic music to fuse Jamaican influence into their tracks. It's perfect for DJs aiming to mash-up tha dance, and even vocalists or groups looking to complete an album. This pack provides the essential tools for deep mellow Dub, Contemporary Reggae, Dubstep, Dancehall, Ragga, Dubtech, and Future Dub, as well as the potential to bring brand new genres to life. Future Clash features an exclusive bonus set of original vocal bits from the classic reggae singer Devon "Bobo Saw" Clarke, friend and protege to the late great Tenor Saw. Throughout his fruitful career he has shared stages with Sizzla Kalonji, as well as the legendary Burning Spear, Bounty Killer, Frankie Paul, Pam Hall, Mikey Merican, and Jigsy King. Recently, Bobo Saw has twice graced Beatport's top Dubstep chart with remixes of his New York City underground anthem "Chip Off The Iceberg. For ultimate utilization, Future Clash is equipped with a Bonus One Shot folder—a full kit of original drum samples—plus a bonus content folder to unlock your creative juices. We know this wicked pack is something. Far from your typical Dub/Reggae sample pack, Future Clash remains true to its roots while delivering a next-level sonic clash like none other.